Fall Fundraiser: Aperitifs & Divertissement Aperitifs & Divertissement (small drinks & enjoyable distractions) Join us Saturday October 1, 2016 from 5-7pm, as we start the 2016-2017 Season in style! 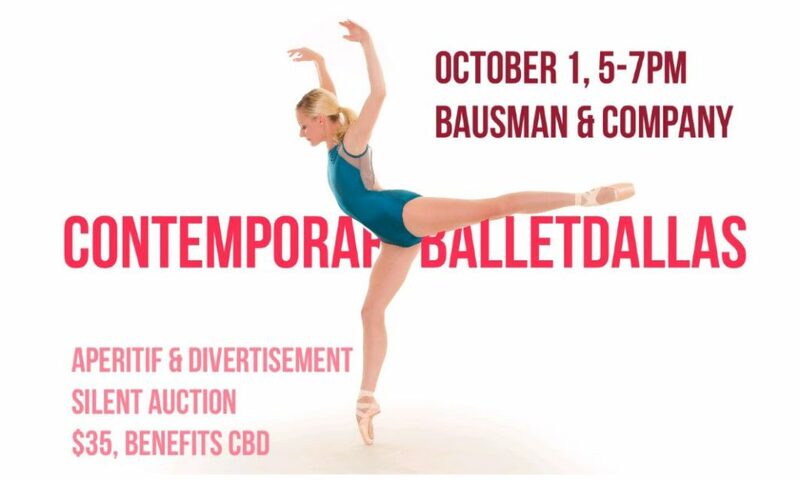 CBD presents Apertifs & Divertissement hosted by Bausman & Company in the Design District. The evening includes wine, hors d’oeuvres & a silent auction followed by and a short performance by CBD. Mingle with the dancers, friends & board members and learn more about our upcoming season! We have exciting news to share about our amazingly talented Guest Choreographers, new company members & more! Tickets are $35/each and support CBD’s concert season & community outreach activities. Saturday, October 1, 2016 – 5:00-7:00pm Bausman & Company 150 Turtle Creek Blvd., Ste. 210, Dallas, Texas 75207 Located in the International Building on Turtle Creek in the Design District. Please turn into parking lot from Irving Blvd. Suite 209 is on the left at the back of the complex.